The brave souls are gone, but they can never be forgotten. On Veterans Day, let’s remember and salute their courage. Liberty comes at a price and the men and women who serve our country are willing to pay that price for our freedom and for peace. Today, we thank you, we salute you, we honor you Veterans. Happy Veterans Day to all the men & women who have risked their lives so that we could enjoy the freedom of living in this country! Your sacrifice does not go unnoticed. You are heroes and worthy of honor, today and everyday! 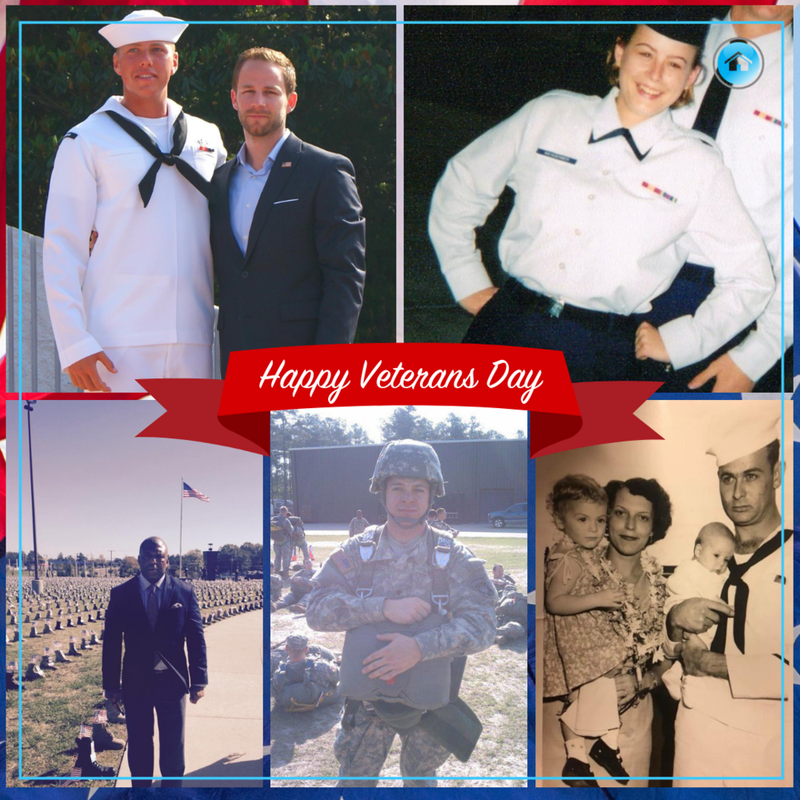 A special thank you and recognition to some of our VBSRE family members who served. From the top: Brock Ruebel and Seth Capehart, Tristan Skiles’ brothers who served in the U.S. Navy; our very own Brittnye Stroup who served in the U.S. Air Force; Kevin Zimmerman, Tiffany Haynes’ father who served in the U.S. Army; Ryan Von Moll, Sarah Von Moll’s husband, who served in the U.S. Army; and James Aubrey Melvin, Angela Williams’ grandfather who served in the U.S. Navy. What We Can Do For You: An Overview Of VBSRE! From just listed to sold and everything in-between, VBS Real Estate can handle it all! Our Real Estate Virtual Assistants work hard to make your business run smoothly so you can worry less and live more! We handle everything from intake of the contracts to managing listings to promoting on social media and sending out monthly e-blasts to bookkeeping and to infinity and beyond! Ok, maybe not that last part - but we do our best to meet all our clients needs and we will go above and beyond to exceed your expectations. Take a closer look at each area of expertise and make sure you jump at the opportunity to join us during our next open enrollment! From the moment of executed contract, we handle all aspects of your transaction. Ensuring escrow has all needed items, lender follow-ups, gathering documentation for contingencies, call to clients, documentation review and your internal reporting will be handled with the ultimate care that only VBSRE can provide. New listings are handled from entering into MLS, One Page flyer, Sellers Handbook, posting to social media platforms, sending out eblasts, Just Listed postcards, and enhancing the listing on all property listing sites. All the agent needs to do is prepare for contract negotiations! Among the hectic life of a successful agent, there is little time to manage the marketing side of your business. Connect to new clients and stay connected with past clients to ensure referrals still come your way. Find out how we can put into place one off projects or re-occurring campaigns that keep the phone ringing! Managing your inbox, returning follow up calls, setting up appointments, and handling your office while you are out of town. This is just a small list of tasks that we can handle with ease and professionalism that ensures your business is moving full speed ahead so you can focus on income producing activities. DO YOU WANT TO PUT HOURS BACK IN YOUR DAY? We have much more to offer and you can take a look at everything on our site! See samples of work we’ve done, meet the team behind VBSRE, read up on our blog and events we’ve been doing recently, check out events we’re hosting, and tons more! We cannot wait to help your business grow! Remember to keep an eye out for our next open enrollment session! 2019 PLANNERS ARE IN STOCK! Happy October, friends! Fall is here!!! Our planners have arrived! YAY!!! We hope you are as excited as we are! Be on the lookout for your packages if you placed a pre-order - they should arrive to you very soon! If you haven't ordered already, what are you waiting for?! Don’t miss out on our brand new 2019 Planners! They would make great gifts for everyone in your office. A design to fit any personality. Let us know if you have any questions and please feel free to share a review on our Facebook page. Tierny Jordan and Adam Bailey poured million dollar advice into a room of agents this morning! If you missed it, you missed a lot! Thank you to the The Inspection House for hosting such a phenomenal conversation and allowing Virtual Business Solutions Real Estate to partner with you once again! Our truly amazing Listing Coordinating Manager, Brittnye Stroup, took a trip to Texas to catch up with some of our wonderful clients! Brittnye had back to back meetings, great lunches and even got to catch up with our other awesome VA, Angela Williams! Thank you Brittnye for all that you do! You're a ROCKSTAR! What a Wonderful Bond 101 Class with Bob Johnson! One of my top producing agents advises spending all your extra time with lenders, learning how you can help every buyer you meet. He shared about the different products that can service your clients' needs and how to be the smartest agent in the room when you are speaking with potential buyers. What an awesome class, Bob had an overwhelming amount of knowledge to offer and we thank you all for joining us! Bob Mortgage Interviews Tiffany Haynes, Owner & CEO of VBS Real Estate, about her business and how she got where she is today. You NEED to listen to this interview! If you are a Realtor or a business owner & need a right hand man to help you grow, market & elevate your business to the next level? I had such a great time being the Bob Mortgage Jam Session! Please check it out and keep an eye out for our next Open Enrollment if you're interested in our services for your business! Pre-Order Your Beyond Routine Planners for 2019 NOW! Ladies & Gentlemen ... our Pre-Sale is happening NOW! Last year our Real Estate planners sold out by the Holiday's. Now is your chance to pre-order and secure the planner(s) of your choice. We have made many enhancements to our 2019 line of planners and listened to you ... our customers! Our 2019 planners include thicker paper, less pages, upgraded layout, Smyth sewn binding options, weekly editions, a leather edition, and more! Get your order in before we sell out. Quantities are limited! Register Now: How to Stand Out From the Crowd! UPCOMING CLASS: HOW TO STAND OUT FROM THE CROWD WITH PRESIDENT OF SELLING IN A SKIRT, JUDY HOBERMAN! Understanding how Realtor’s can stand out in the business world today is not only relevant, but critical. The Real Estate market is more crowded than ever before with everyone competing for the same clients, properties and listings. What are the activities that will set them apart? Attendees will learn strategies to become the expert in their space rather than simply blending in. They will be able to create the experience for their customers that will keep them coming back again and providing referrals. Being able to be intentional with their marketing, networking and relationships will round out the session. If all of this sounds like something you'd love to learn about, then this is the class for you! Join us as we learn directly from the President of Selling In A Skirt - International Speaker, Trainer, Coach and Mentor, Judy Hoberman! There will also be a Q&A session, and our instructor will be happy to answer any questions you may have. 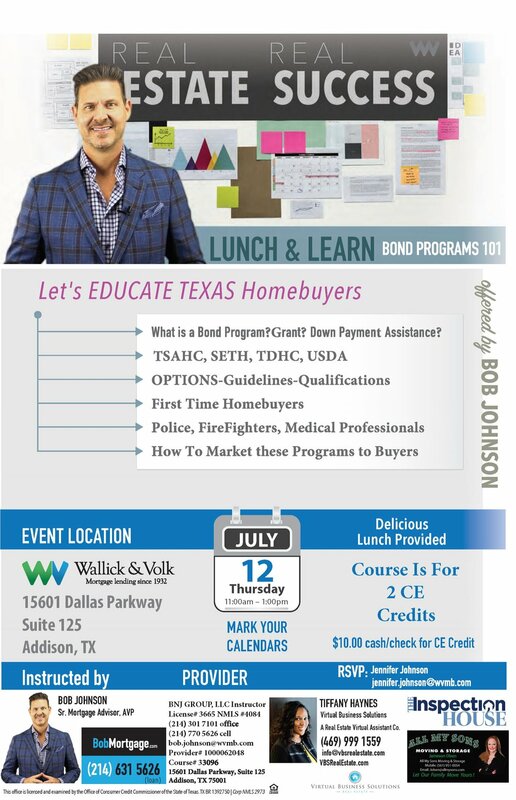 We hope to see you all at this very special CE Class Event from CE Providers Steve Ortega and Westcor Land Title Insurance Company! We had a full house last week learning more about 1031 Exchanges with Lu Ann Blough! Great information!! We are looking forward to next months class on Inspections and hope you will join us. Be on the lookout soon for sign up information. Next Level Agents: April Financial Planning Class Was A Hit! We had another successful #NextLevelAgents class in April with the best real estate agents in DFW! This topic is near and dear to our hearts. #FinancialPlanning for entrepreneurs is an overlooked missing piece in most business plans and A. Box Financial presented a candid and transparent conversation to a group of professionals, so we can be honest about where we are and start preparing for our future life. Thank you to the amazing Annetta Taylor! Stay tuned for sign ups for our next class! Next Level Agents: Thank You for a Successful Class! YAY, we did it!! Thanks for such a great class in March. The feedback we received was very positive and hopefully we can all benefit from the wealth of knowledge that Cheri Feuerbacher shared with us. We are thrilled with how great the turn out has been for these classes and we hope to see you at our next class! Stay tuned for info on the upcoming Next Level Agents class. Want to catapult your business to the next level in Real Estate, there is no better way than with more listings! Nicole Espinosa and Kim Davis sold over 225 listings last year, and they are going to share their listing secrets with you! We can ONLY allow 300 people maximum and it’s first come first serve!! Upcoming Class: Financial Planning for Your Future! UPCOMING CLASS: Financial Planning for Your Future with Financial Planner of A. Box Financial, Annetta Taylor! If you are wondering how you can save for your future with a commission based income then this is the class for you! Join us as we learn budgeting tips and strategies directly from Financial Planner Annetta Taylor on how to use commission payments to your advantage in order to prepare for the future, for taxes and for growing your business! There will also be a Q&A session, and our instructor will be happy to answer any questions you may have. Time will be left after class to pull Annetta aside for anyone needing one on one consulting! We hope to see you all at this very informative event! Today we’d like to introduce you to Tristan Skiles and Tiffany Haynes. Tristan and Tiffany, let’s start with your story. We’d love to hear how you got started and how the journey has been so far. We, Tristan Skiles and Tiffany Haynes, are the founders of Beyond Routine, LLC. We run a very successful Real Estate Virtual Assistant Company. The Virtual Assistant company started with one person and has grown to into a full staff, supporting entire real estate teams and brokerages. Finding a planner that encompassed everything we were responsible for was daunting. Most of the time we found ourselves customizing the planners that we used, as they were designed more for the general busy professional. The planners did not assist with all the different departments you have to manage when running a company. We didn’t have a place to track expenses or to track marketing performances to ensure we didn’t throw money down the drain. The planners didn’t help reverse engineer our long term goals to ensure that our weekly and monthly goals were in alignment. The planners task lists didn’t separate the must do’s of the day with a separate section for the less important. So, the idea was dreamed up to to design our very own planner and Beyond Routine was born! We are actively immersed in the Real Estate Industry on a daily basis. There is not an agent that we come in contact with where advice is not given! Together, we help agents construct their financial goals for the year and discuss how that transcribes to the things you need do every day to ensure you reach those goals. We teach agents that you cannot just focus on buying and selling real estate if you want to be in this for the long haul. You have to think of your business like a company, reviewing every subset of your business and ensuring those tasks are on your radar or strategically delegated to an expert in that field. The successful Virtual Assistant company, VBS Real Estate is now referral only, we only take clients that are referred by active clients to ensure their quality and reputation is always at a manageable rate. It was without a second thought that we designed a planner just for Real Estate professionals to ensure agents had complete control over their career and lives. It is the objective that the agent was left to begin with the end in mind and had a guide to take with them as they served families but kept their business and well-being a top priority as well. During the process of designing the Real Estate Edition Planner, we were approached by several entrepreneurs, small business professionals, friends and family who desired the same goal planning and strategy pages that the Real Estate Edition planner had to offer. Being that we were busy professionals ourselves we knew that this was a need that we could meet. Thus, the Entrepreneur Edition was created to help busy professionals and entrepreneurs, like ourselves, manage their daily tasks, strategize, dream and plan. To say this is a labor of love is an understatement! Hours of planning, designing, strategizing, gathering market research and simply putting ourselves in the seat of the entrepreneur were all done to get this right and to make sure it encompassed everything needed. To live Beyond Routine is an invitation that we worked hard to be able to offer our customers. We hope that each customer accepts this invitation! If you do, we are committed for a lifetime to evolve year after year with you. Taking in your feedback and providing the most efficient and innovative planner they have ever used! As with any first year of business, there have been some hiccups along the way. We went into this with confidence, a budget and high expectations. Each of which was a bit shaken at one time or another. Because this was our first year and we were so excited to offer this product to agents, we decided to offer pre-sales of our planners. We had discussed with our printer the turn-around time for production and shipping and were confident that all items would be in stock in time. However, as with any shipment of this nature, delays are common and we had just about every delay possible hit us. This was so frustrating for our customers as-well-as for us! We made a decision not to do pre-sales again and to make sure we are ordering early enough to have all product on hand by the time the customer places their order. Another thing, we really didn’t know about was the expense of shipping cargo by sea and all of the freight, transportation, loading and miscellaneous other charges that incur. These add up quickly and was something we did not expect. Lastly, once we received our inventory and began shipping planners out to customers we learned of some printing errors that had taken place. These are common and do happen in mass production in low volumes. However, for us, this was unacceptable and did not meet our standards of the quality that we expected in our product and wanted our customers to receive. We made it a point to make sure that moving forward our high expectations are met and that inventory control is a high priority. Each of the above instances shook our confidence at one time or another. However, our love of this product and the feedback, compliments and high demand from so many amazing customers have just confirmed what we knew when we began this journey. Continue reading the rest of the interview here. Upcoming Class: Confused on the TREC Contract Changes? Confused on the TREC Contract Changes? COME LEARN IN A FOCUSED SPACE BY A TREC CERTIFIED TRAINER WHAT THESE CHANGES MEAN FOR YOU! We have reached a huge milestone here at Virtual Business Solutions Real Estate! The company as a whole has coordinated 1,000 contracts as of this month! Transaction coordinating started as a service that only our CEO Tiffany did, while our COO Tristan did the listings. We have evolved to a staff of thirteen, 5 of whom are transaction coordinators. In 2016 we created a transaction coordinator manager position to complete audits, increase oversight and to have ongoing and available mentorship. Robust & Thorough: Sending all contact information to all parties no matter whose side we support. Proactive measures, asking for items before they’re late, checking in with all parties before issues are brought to us in the final hour. Handling the clients system of record - Dotloop, Skyslope, Reesio - we know them all! Sending the extra touches to the client (utility transfer, walk through of home warranty process). Marketing Included: We ensure everything you need to maximize from your transaction is included. Request reviews, social media posts after closing and designing your Just Sold postcard. Brand Ambassador: Our coordinators work out of assistant accounts to appear in-house with the agent. Many agents that call me have worked with our team on the other side of transaction and never knew. Our intention is to strengthen our clients brand and not our own. Our team goes above and beyond to please each client. Their ambition to over deliver, coupled with a robust and proactive system, all packaged at a price an independent agent can pay or a broker can absorb for his team, has positioned us as leaders in this niche industry. In honor of our 1,000th contract we are doing something we have NEVER done: if you are an active client, that has never used our TC service we are waiving our deposit so you can see what all the hype is about! If you are not an active client, we are a referral only company with quarterly open enrollments, we are not currently in open enrollment but to celebrate we will waive the requirement for 72 hours if you would like to add hours into your day to focus on your highest and most impactful tasks. Thank you to an amazing team and incredibly loyal clients, we celebrate today, 1,000 contracts coordinated! Next Level Agents: Thank You for Attending Our Appraisal Class! Next Level Agents is a resource and class dedicated to agents that are ready to go to the Next Level! All classes are live in the DFW area and are sponsored by Fidelity National Title, Iberia Bank, Goosehead Insurance and VBS Real Estate. Our first class was a huge success! An interactive and packed room kicked off our Next Level Agents class for 2018! Thank you for coming and a special thank you to Steve Nichols for contributing his wealth of knowledge! Stay tuned! Information on the next class will be released soon. We hope you to see you there!